These native early birds are already up. Like kids counting down to Santa, they can’t wait to open their presents to us come spring. Drought doesn’t scare off naturalizing rhizomes like spiderworts, or bulbs like Narcissus ‘Falconet’. Narcissus ‘Erlicheer’ and Leucojum too have shared more than one rain-deprived season with me. If anything, it’s the monsoon years or diligent sprinkler systems that rot bulbs to death. Narcissus ‘Grand Primo’ is another that’s been around in gardens longer than mine, rain and shine. By November, when it’s time to plant our spring bulbs like Spring starflower (Ipheion) you know it’s bound to be cooler! With or without the first pop of rain, the oxalis will show up soon, too. Still, the ones that can entice us may be annuals for us. That’s fine if you want that burst of magic for just a year. If you’re like me, and prefer to plant for the long-term, join Tom and Chris Wiesinger this week to select the naturalizing bulbs that will be around a lot longer than the time it took you to plant them! Known as “The Bulb Hunter,” Chris is the guy behind The Southern Bulb Company. He drives the back roads to save old bulbs from bulldozers, and knocks on doors to collect a few heirlooms from old fields and gardens. He’s found the survivors that pass along the rich heritage that bulbs contribute to our garden delight. Late spring brings Johnson’s amaryllis (Hippeastrum x johnsonii). In fall, pair oxblood lilies and lycoris with Autumn crocus (Sternbergia lutea). Ooh, can’t you just imagine those little tufts of yellow peeking out among the brilliant reds? Get Chris’s bulb list. A caveat: some of them he mentions, like Tulipa praecox, are extremely hard to find. Give The Bulb Hunter some time and keep an eye out for them. Find out lots more in his incredible book, Heirloom Bulbs for Today, published by Bright Sky Press. He and co-author Cherie Foster Colburn fill your imagination with heritage stories, but fulfill your practical side with exact information on planting and bloom times. Along with exceptional photographs, it’s beautifully illustrated by Loela Barry and Johan Kritzinger of JoLoè Art. And if you’re on the hunt for indoor décor, notecards, or original design clothing, here’s more from JoLoè Art! Here’s a picture of the whole gang in front of framed prints. Johan, Loela, Cherie, and Chris. And thanks to Michael Hardy at The Southern Bulb Company for all his help! Daphne continues our “bulb” theme with a question we often get: Why don’t my bearded irises bloom? These are supreme drought-tough plants, beloved for their perpetual striking foliage and bounteous flowers in spring. But if they don’t bloom, they could be lacking in sun, nutrients, or suffering from borers or rot. Most of the time, they’re simply over-crowded. Daphne explains what to do! For a demonstration on how to divide bulbs, check out this video with Trisha. On tour, we re-visit Lauren and Scott Ogden’s garden where drought-tough structural plants join seasonal surprises. In these endless hot days, I’ve been shading new plants like crazy. We think of row cover as frost protection, but this week Trisha explains how to use lightweight rowcover to block 15-20% of the light barreling down on your new plants. This is a great idea if you’re planting vegetable seeds this hot fall. A little shade will protect those seedlings so they don’t fall over in disgust. Augie doggie’s Garden Pet of the Week is Jack! Jack’s a miniature schnauzer who loves his dad’s garden. And we do, too! Is that gorgeous or what? Seth Moore set up this birdbath for our thirsty garden friends, but they can’t resist sharing with cute little Jack! Hey, send me your favorite garden pet, drought-tough plant, tip of the week, and question to llehmusvirta@klru.org to feature on CTG! 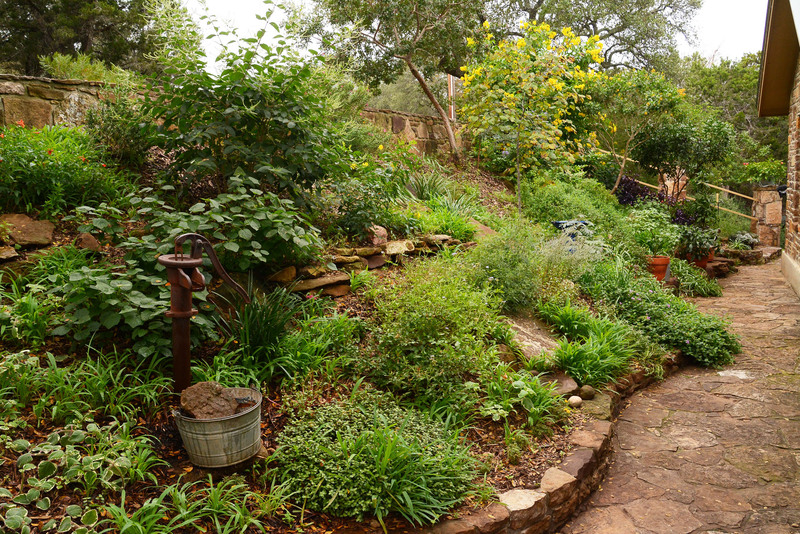 What’s your plant or tip to help us through the drought? Follow us on Facebook for CTG updates along with super viewer tips and pictures.